Moon jellyfish. Photo credit: Ty Basinger and Michael Abrams. Some facts about jellyfish according to National Geographic. Jellyfish are favorite meal of sea turtles. In 1991, moon jellies flew aboard the space shuttle Columbia for a study on weightlessness and development of juvenile jellyfish. 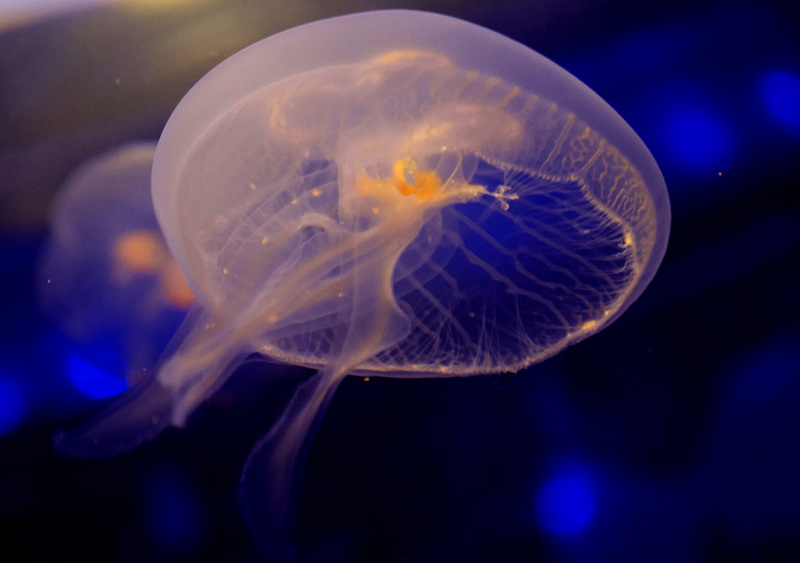 Although they have no brain, jellyfish have somehow been smart enough to survive for more than 500 million years. 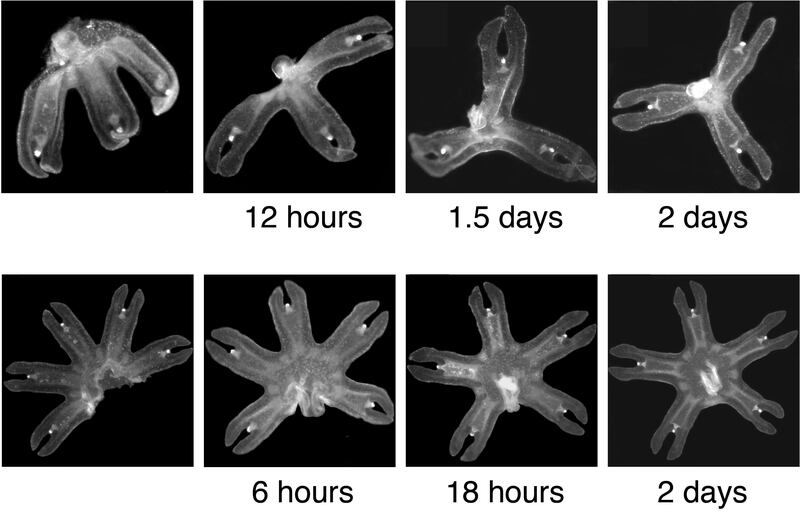 Almost by accident, we began experimenting on the moon jelly Aurelia aurita in the lab. 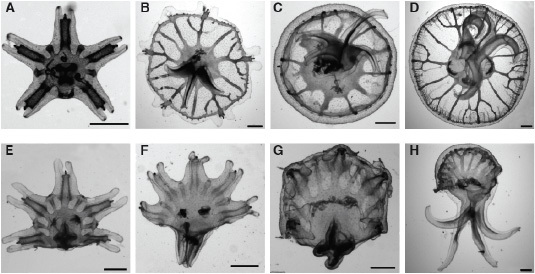 To our delight, we discovered that jellyfish ephyra, the juvenile jellyfish, displays a unique mode of self-repair. Check out our manuscript here. Click image to see movie of a swimming ephyra. 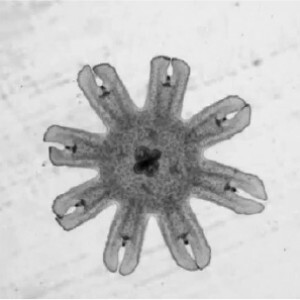 Upon amputation, we observed that instead of regenerating the lost parts, jellyfish ephyra reorganized existing body parts and arms, and regained radial symmetry – all completed within 12 hours to 4 days. We call this process symmetrization, to denote the recovery of functional symmetry, rather than regrowing precise parts. Click image to see movie of a symmetrized tetramer swimming. About 90% of the ephyrae amputated symmetrized. Symmetrization facilitates further growth and development, whereas those ephyrae that remained asymmetrical grew abnormally and could not swim very well. 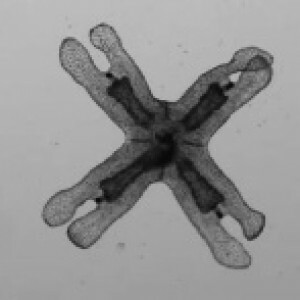 Fascinatingly, we found that symmetrization does not require cell proliferation or cell death. Rather, it is predominantly driven by mechanical forces generated by its own muscle-based propulsion machinery. To see how muscle contraction could drive symmetry recovery, we teamed up with Chin-Lin Guo from Academia Sinica. We put the compressive forces from muscle contraction in the context of the ephyra geometry and viscoelastic response from the mesoglea. And indeed, by considering these forces generated during propulsion, we can mathematically recapitulate the recovery of global symmetry. 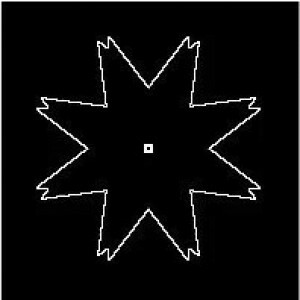 Click image to see mathematical simulation of an ephyra regaining radial symmetry. Therefore we have here a self-repair mechanism driven by a constitutive physiological machinery. Forces generated by the propulsion machinery sense the imbalance and drives its own repair. In addition to Aurelia, we also observed symmetrization in the sea nettle Chrysaora pacifica, the lagoon jellyfish Mastigias sp., and the Mediterranean jellyfish Cotylorhiza tuberculata. And this is not all! We are being surprised more and more by incredible phenomena we are seeing in jellyfish. Stay tuned for more updates soon.